We’d love your help. Let us know what’s wrong with this preview of Hashes & Bashes by P.J. Colando. But then an outsider arrives, claiming to be kin, and HAS FAITH… FAMILY… FRENZY! To ask other readers questions about Hashes & Bashes, please sign up. Hashes and Bashes is the second book about the Breeden family on their farm in the Midwest. After the escapades of Jackie and Steven in the previous book that ended after the trip that they took out west, on their quest to take a much-needed vacation in the RV that Jackie purchased as a retirement gift to herself. Jackie has a penchant for selling pot in the form of cookies. These were sold along with the dairy delivery route that they had. When their daughter in law was found out this had to st Hashes and Bashes is the second book about the Breeden family on their farm in the Midwest. After the escapades of Jackie and Steven in the previous book that ended after the trip that they took out west, on their quest to take a much-needed vacation in the RV that Jackie purchased as a retirement gift to herself. Jackie has a penchant for selling pot in the form of cookies. These were sold along with the dairy delivery route that they had. When their daughter in law was found out this had to stop. In this book, we are introduced to Carl Edwards, the brother that Steve never knew he had, he does have another brother David but they really don't get along. Carl comes from California, has a penchant for wearing Hawaiian shirts and every one loves him. Carl decides to buy the farm down the road from Jackie and Steve and soon finds that there may be oil on the property. So drilling starts but the outcome is not exactly what Carl hopes it will be. Jackie has gone back to her job at the school and life seems to be a bit more fun in the Breeden household with the addition of Carl to the family. They spend a lot of time together until a horrible thing happens to get in the way of family love. A whole cast of characters, some old, some new are melded together to create another fun and funny story of Jackie and Steve. Reading one of P.J. 's books is an experience that you don't want to end. Lots of funny situations, I especially love the parts about the cows and especially the bull that loves to sleep on it's back with feet up in the air. I had to giggle when I read that part. I could see it in my mind's eye. A lot of detail within the story I can relate to, well not the farm bit, although I did live on a farm when I was a kid, but just the life that exists on the Breeden farm, definitely Midwestern in nature. I am a midwesterner myself so, yes, I can relate. When I read one of P.J. 's books, it never fails that I get the giggles, with how she tells a story, you feel like you are right there between the pages! I think if you are going to read one of these books you should really start with the first one, Stashes. It definitely sets up the story in the second book. I highly recommend these books! Paints a wonderfully detailed and accurate portrayal of life in a small farming town in the Midwest. I felt like I was home again! Except we didn't have medical marijuana when I lived there, and there would have been a lot more casseroles involved (because that's how my people do). The dialogue was especially great, very spontaneous and natural. I loved the characters, especially Jackie and Steve; they felt so real and down-home, heroic in their own quiet, loving way. Plus Funny and heartwarming! Paints a wonderfully detailed and accurate portrayal of life in a small farming town in the Midwest. I felt like I was home again! Except we didn't have medical marijuana when I lived there, and there would have been a lot more casseroles involved (because that's how my people do). The dialogue was especially great, very spontaneous and natural. I loved the characters, especially Jackie and Steve; they felt so real and down-home, heroic in their own quiet, loving way. Plus, it was nice to read characters I can relate to -- middle aged, dealing with realistic crises in their everyday lives -- family, friends, football, and finances. Not to mention endless church bake sales, and of course, gossip! When I got the book I didn't realize it was book #2. It felt like enough of what happened in the last book was covered that I was never confused about what was happening here. Still, I would strongly suggest reading the first book before you read this one, because this one gives so much away about what happened before. Hashes and Bashes is a fun read with lots of humor and just the right degree of poignancy. Being a lifelong Michigander, I appreciated P J Colando's accurate descriptions of the landscape, the economics, and the people of my state. I enjoyed the Midwest meets California mash up when secret brother Carl appears. We're given a good picture of this potential cultural clash. Just when it seems that Jackie or Steve will lose it over this stranger in their midst, their midwestern sensibilities come to Hashes and Bashes is a fun read with lots of humor and just the right degree of poignancy. Being a lifelong Michigander, I appreciated P J Colando's accurate descriptions of the landscape, the economics, and the people of my state. I enjoyed the Midwest meets California mash up when secret brother Carl appears. We're given a good picture of this potential cultural clash. Just when it seems that Jackie or Steve will lose it over this stranger in their midst, their midwestern sensibilities come to the fore and all is resolved—or at least put up with! The characters of this tale are full of quirky foibles yet they are very much like people I've encountered in true life. The author employs humor is such a skillful way that she brings life to her characters without making them caricatures. As well as spinning a fun story while providing lots of laughs and some thought provoking insights along the way, P J Colando should be dubbed the Aristocrat of Alliteration. Her writing is clever and poetic. 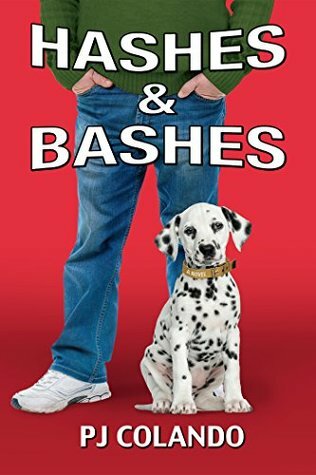 I’ve been looking forward to another humorous and heartwarming novel from P J Colando, and let me tell you, “Hashes and Bashes” kept me alternating between laughter and tears. Now, grab a seat and let me tell you about this book because you’re going to love it! What sets P J Colando apart from many others is her ability to draw the reader into the life of her characters. As the reader, you feel like you are her protagonist’s (Jackie) girlfriend and she is sharing with you what is going on in her I’ve been looking forward to another humorous and heartwarming novel from P J Colando, and let me tell you, “Hashes and Bashes” kept me alternating between laughter and tears. Now, grab a seat and let me tell you about this book because you’re going to love it! Hashes and Bashes takes us deep into the heart of America’s Midwest but it begins like something from the Wild West as a Ronald Reagan lookalike rides into town and turns the sleepy world of Steve Breeden upside down by professing to be his half-brother. Suspicion immediately surrounds this stranger, whose laid-back Californian ways are anathema to Steve, a farmer who has been forced to graft every day to lay the foundations for the happy home he shares with wife Jackie and their son Brandon. Th Hashes and Bashes takes us deep into the heart of America’s Midwest but it begins like something from the Wild West as a Ronald Reagan lookalike rides into town and turns the sleepy world of Steve Breeden upside down by professing to be his half-brother. Suspicion immediately surrounds this stranger, whose laid-back Californian ways are anathema to Steve, a farmer who has been forced to graft every day to lay the foundations for the happy home he shares with wife Jackie and their son Brandon. This distrust deepens when Steve discovers his half-brother Carl has been using two different surnames but the stranger soon proves his family credentials beyond doubt and the Breedens set about helping him build a new life in their community. It’s a community that centres around the local church, with farmer Steve doubling as a deacon for Pastor Paul and Jackie shouldering much of the burden for heavenly fundraising through an endless succession of bake-offs. One of these baking bonanzas provides the main subplot for the book as a batch of Lemon Bars, cooked by an anonymous chef, are laced with marijuana and end up putting a bastion of the local community in hospital. This causes quite a storm and is a telling nod to Stashes, the prequel of Hashes and Bashes, which is hinted at in various junctures. The main consequence of events in Stashes is that Brandon’s ex-wife Amy, who dragged the Breeden name through the mud by involving the family in her venture of making marijuana edibles, is now in jail. Brandon, a star quarter-back at high school who failed to live up to his potential by earning a gig in the NFL, doesn’t seem too perturbed by this fact and instead revels in his status as the town’s most eligible divorcee. Local ladies are queuing up to rock the Winnebago he lives in on the family farm and another of the subplots involves a two-way fight for his affections. Hashes and Bashes is written in a relaxed comedic style but it also has hidden depths. PJ Colando likes to reference Bruce Springsteen from time to time – Stashes begins with Born To Run blasting out as a ring tone ¬ and this sequel shines light on the kind of communities you imagine while listening to Springsteen’s songs. There’s a darkness on the edge of this particular town, with one macabre plot twist coming when you least expect it, but it mostly remains on the periphery. Instead, it’s the warmth of the well-drawn characters that shines through, especially from matriarch Jackie. While the book’s plot centres on the relationship between three male siblings – Steve, his greedy brother David and the newcomer Carl ¬ it’s Jackie who anchors the Breeden family and much of the community itself. I suspect Jackie shares many traits with the author herself and you can tell this is a character whose expert crafting came rather easily. Hashes and Bashes crams a lot in and my only complaint is that some of the avenues it goes down aren’t explored fully enough. I would have loved to have learned more about the mysterious figure who holds Brandon and one of his squeezes hostage at one point but instead this major plot development is rather washed over. Perhaps PJ Colando is saving more for the book three she hints at in the last few pages? PJ Colando returns to the lives of Jackie and Steve Breeden and their close knit community with Hashes & Bashes, a fun novel filled with eccentric individuals, small town gossip, and a whole lot of heart. This is the second novel in the Jackie and Steve series and is just as cleverly written as the first book, Stashes. Hashes & Bashes recreates the atmosphere of the Midwest with its quiet, particular towns, only to contrast it greatly to the interloper, Steve’s Hawaiian shirt wearing hal PJ Colando returns to the lives of Jackie and Steve Breeden and their close knit community with Hashes & Bashes, a fun novel filled with eccentric individuals, small town gossip, and a whole lot of heart. This is the second novel in the Jackie and Steve series and is just as cleverly written as the first book, Stashes. Hashes & Bashes recreates the atmosphere of the Midwest with its quiet, particular towns, only to contrast it greatly to the interloper, Steve’s Hawaiian shirt wearing half-brother Carl, who hails from sunny California and whose presence shakes the home that the Breeden family has built for themselves. Throughout the novel I found myself laughing alongside cleverly placed quips, often from the mind of Jackie, as well as the outrageous events that only seem possible when the Breeden family is involved. Colando is an expert at world building, using lush description of people and places to transform the reader’s imagination into the reality of the American Midwest. You will find yourself hooked from the first page, with dense and detailed descriptions and events that makes it feel as though you were right there alongside the Breeden family through every twist and turn that comes their way. Having read both PJ Colando's first novel Stashes and her second, Hashes and Bashes, I enjoyed getting to know her characters Jackie and Steve and their unexpectedly adventurous Midwest small town farm life. Her descriptions leave me hungry for some Midwest baking (I'll pass on the hash, though). In the very heart of this story is a bond of family, friends, and community trying to survive. Hilarious mayhem follows with the meeting of new people and bumping in to old acquaintances (Stashes), all intermixed with a wealth of interesting antics and drama that far surpass my big city, CA lifestyle. When these characters play with and off each other, anything can happen. Fun and Zany come to mind on this read that screams TV Sit-Com! This fiction is peppered with some real facts; Silly Hats &am In the very heart of this story is a bond of family, friends, and community trying to survive. Hilarious mayhem follows with the meeting of new people and bumping in to old acquaintances (Stashes), all intermixed with a wealth of interesting antics and drama that far surpass my big city, CA lifestyle. When these characters play with and off each other, anything can happen. Fun and Zany come to mind on this read that screams TV Sit-Com! This fiction is peppered with some real facts; Silly Hats & Caps does exist in Orange County, CA. This is a group of real people with a passion for finding a cure for Type 1 Diabetes. Working along with JDRF to gain research funds so that Type 1 will soon be Type NONE! PJ Colando knows this small town and her characters in it. She has a great respect seasoned with trust, that we the reader, will enjoy this journey to farm country. We come into the book as observers and leave as family. Although cow insemination, fracking, and hash fascinate, the smaller sorrows, hopes, romance, and language made this Michigan setting a terrific trip. If you enjoy an engaging book about the joys, challenges and foibles of family told with humor and sympathy should read this book immediately. I was born and raised in the Midwest, but unabashedly aspired for adventure elsewhere, following my parents' model. I live in southern California, where seasons seldom matter, where any promise can be conjured and fulfilled. I write while my husband watches TV sports, which are always in season = often. My genre is Boomer Chick Lit. I write humor and satire with a literary bent. I am having a blast I was born and raised in the Midwest, but unabashedly aspired for adventure elsewhere, following my parents' model.